The Snap Test found a nice firm crack of a whole Chip as it split in half. We put a couple together and it felt like eating a firm cracker. There wasn't the brittle snap of a regular Chip, but there was instead, a firm hearty crunch. 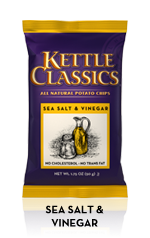 There were not many large Chips in our test bag, and most were fairly flat, which is unusual for Kettle Cooked Chips. There were some bubbles, but not the quantity you see on Chips that have been fried quickly. They had a sort of dark yellow tinge to them, with some potato skin on the edges. There was also some visible powdery seasoning. A Nose Plunge Test revealed a Mild vinegar aroma. This flavor was the second ever invented (behind Cheese & Onion), back in the 1950s in the UK. Sadly, there are very few US based Chips manufacturers that get the flavor combo right. The Vinegar almost always overpowers any salty seasoning. Not so with these. The overall taste was mild, but the pairing got an equal airing.